Matt looked around curiously. He remembered the promise he made to Sarah and knew that they couldn't turn back now. He looked dwon at his belt. "I don't know most you..." He smiled. "Let's get acquainted." He dropped a handful of pokeballs onto the ground unleashing all of them. Ivysaur, Gastly, Lapras, Pidgeot and Snorlax all looked at eachother awkwardly. "Well? What are you waiting for? If we're gonna fight together then you need to get to know eachother." No words were exchanged only glares. "Hmph...fine. See that?" He pointed to Rayquaza. "I want you to beat that. Nobody's leaving until you learn to work as a team. It's the only way." Ir roared harshly at the 5 pokemon. "I'm waiting." He smiled proudly as they put together their efforts and started to fight the dragon. Midway throughout the week when everyone was asleep and exhausted from a full day of harsh training, Diseh teleported back to the shrine outside the base. He was previously checking the stability of the world, making sure everything was going to plan while everyone rested. All of a sudden, he caught a glimpse of a shadow, a woman walking his way from the forest. He squinted to see who it was, fearing for the worst. But she wasn’t a threat. It was Sarah. “So, this is where you’ve all been…” Sarah looked around the mysterious place as she stopped, looking over the mystical presence of the shrine and the pond to her right, “All this time protecting the forest, I’ve never once caught a glimpse of this place before. But for some odd reason, this place just feels like home…” she spoke softly. “I expect great things from him,” Sarah spoke firmly, “He’s going to grow up to be a very strong person. I hope you’re looking after him in Spence’s absence...” she tilted her head in curiosity, being somehow protective over him. “Heh, yeah,” he smirked, “Looking after him, alright. I’ll have to beat the **** out of him for this...” he muttered cruelly. Sarah walked over and sat on the shrine next to him. Diseh quickly nudged over and away from her on the opposite side. He seemed afraid of her. “So it’s true…” Sarah looked sadly to the ground. It seemed like a lifetime of silence after that. They sat there until Sarah finally spoke up. “Diseh, I know this must seem impossible… But…” her lips dreaded to continue, to be let down. After another awkward phase of quiet, breaking the silence, Diseh turned to her with shock. He was finally looking to Sarah after he had heard her painful sobbing. She had her hands cupped over her eyes, “I’m so sorry!” she muffled, “I know! You can’t possibly be him… From the photos, you look just like him when he was younger, and before he…! And, you look so much younger than what my father would be now…! But after I heard his name from everyone else, I just… I just had this feeling…! You know…?” she continued crying. Diseh sighed quietly to himself, his eyes looking around for an answer he could possibly give to her sounding plausible. His heart was breaking in two. Sarah looked up to Diseh who had walked a distance in front of her, his back toward her. Diseh looked forward into the distance sadly. He was a clone, he wasn’t the real thing. Even with all Diseh’s memories, the real Diseh was dead. He died long ago. “No, I’m not you’re father. I’m not the Diseh you know,” he said with a calmness about it. Sarah looked down and sniffled, feeling the tears come again. Sarah looked up. She didn’t know what to say or what he was talking about. At that moment, Sarah sprang up and latched onto Diseh from behind. Diseh’s grunted. Suddenly, he felt odd. Memories of Tori flooded into his mind. “Thank you, Diseh, thank you…” she held his back close and warmly in a hug. Diseh suddenly felt a smile coming on, feeling somewhat happy and whole. He closed his eyes and felt Sarah’s warm embrace. He felt like an actual person for the first time in his life. Jet opened his eyes slowly and saw a strange room. Where in the hell am I? A strange door in front of him opened causing to Jet fall out of his pod. "I'm serious. Where am I? Ahhhhh great! There is no one in this ..." Jet another pod with Spence in it. "Don't worry Old Man, I'll help us outta here." Jet entered through a door,prepared for anything to attack him but instead saw Red sleeping on a bed. Jet sneaked over to him and tried to wake him. "Red! Wake up! Where are we?" As the room echoed his footsteps, Diseh walked in to stop a distance away from Clarke inside the chamber. "Morning, sunshine! So, are you ready?!" "Operator, Olivine Lighthouse, top level," the hologram span around him. Suddenly, in a thunder crash, Clarke and Diseh stood high upon a wide lighthouse's platform on the roof. To their right was the lighthouse light, rotating and shining a bright light out to sea, passed fog, darkness and heavy rain. Another round of lightning flashes roared above them, the lighthouse light rotating to Diseh. "Operator, pokemon party, three," he said, catching three pokeballs and putting them to his belt, "Well," Diseh continued, as the light went passed Clarke, "Let's get started!" Diseh threw out and called upon Leafeon, the grass Eeveelution. It whipped its leaf tail back as the rain poured on top of them. Red launched up as his nightmare was interrupted. He looked around to find Jet looking a little startled. "Oh we're at an old Solaris base that Diseh took us to. You and Spence were pretty banged up so Diseh put you two in some kind of health pods. You were only out for a day so you didn't miss much. I think the other guys went out for some training with Diseh." Red recalled that Diseh said that he would keep his promise. Jet nodded. "Thanks Red." Jet walked into a room that looked like it would the training room.He saw practically the whole team there, save a few. "Wow, this placee is great. I would not mind getting a little exercise from sleeping in that pod all day. Anyone care to spar?" Matt jumped up and walked toward Jet. "Ya know, we never got a chacne to really meet. I'll spar with you!" He wanted to get in all the training he possibly could before he was forced to fight those who ould actually harm him. "I've always wanted to battle an Elite anyway...what do you say, Jet?" His smile turned to a determined smirk. "Ugh...that kid...he's starting to sound like me..." Jimmy sighed as he turned around in one of the swivel chairs and gazed up at the large broken monitor. He c0cked his head curiously. "I wonder..." He took a quick glance around before stepping up onto the desk and placing one of the larger shards in place. He smiled as it stayed in place but fell shortly after. "Heh...I tried..." He jumped down and walked off with a shrug. "Morning, sunshine! So, are you ready?!" Diseh said. "Oh yeah...Hi sunshine?" Clarke responed unkowning to why Diseh thought Clarke was sunshine. Dished commanded Operator to set the scene for the Olivine Lighthouse. Clarke was stunned. Somethings that he had seen her been done, somethings that he had done. He really wanted to win this battle now. 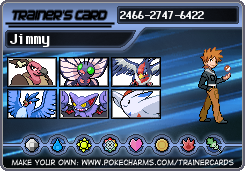 Although Glaceon would have the advantage in type he had already decided that Gardevoir was up first. He grabbed he pokeball, still inside a ball capsule and threw it. Gardevoir came out surrounded by elegant white clouds of smoke. It was Clarke's move first. "Let's get this started! Gardevoir use Shadow Ball!" Clarke commanded he hoped it would hit. Diseh walked into the chamber and stopped in the distance, across the crystal clear pond away from Jimmy. A slight mist started to fall down. "That's... Gold's pokemon, right?" Diseh watched the gator swim around, enjoying itself, "I don't know much about Gold either. I know he became Champion some time in the year 2002, and that he put an end to Team Rocket back in the day." Diseh looked up in a mockful smirk, "Funny how you look up to him, don't you? And you belong to a group of thugs calling themselves Team Rocket. Because if Team Rocket really had their way back then, I'm sure they'd match up to be as crude as what Team Aqua is today." Diseh released his Empoleon, who joined Feraligatr in the water. "Once upon a time, a man named Giovanni created Team Rocket back in 1990. He was an incredibly powerful man, until he was cut down by a young boy called Red 9 years later. No, not the same Red we have here, but another legendary Champion like Gold who saved Kanto from Team Rocket. Giovanni, having been defeated, shortly disappeared to train alone in his remaining days in secret... Leaving behind the team, it left the remaining Rockets unsettled. That's when Rocket decided to conquer Johto for their absent leader's return, but Gold stopped them and put an end to Team Rocket for good." "I guess after 50 years some things do change, but then again, it seems like you're the only sensible one out of the remnants, Jimmy. I know what you did for Sarah, bringing back the pokemon after they themselves stole them. I'm grateful to you for that." Diseh looked down to the water as well, "I'm hoping... If after you guys do manage to defeat Aqua and bring an end to Psyche, maybe a group of people can help restore this world back to the way it was before all this. Jimmy, you are a young, respected leader of your droogs, right?" he looked to him across the rippling pond, the mist starting to fog up around them, "I've never asked for anyone's help before, but when this is all over, could you persuade the Rockets to change their ways, otherwise..." Diseh smirked to himself as he closed his eyes, "I'm sure history will repeat itself, even after Psyche. Even if you don't have much influence now, I'm sure you will after the War, I assure you." "So," Diseh pulled up his half metal arm, "How about a battle? Single match, two pokemon each. My Empoleon against your Feraligatr up first, of course." "Leafeon, dodge!" Diseh called swiftly, the Leafeon flipping back and swerving to the right, the Shadow Ball just missing it. "Nice one! Now, let's give Gardevoir a run for her money! Fury Cutter!" Suddenly, Leafeon ran up through the storm and back flipped into Gardevoir, swiping her with its tail in a furious cut. Leafeon jumped back, ready to pounce and have another go. The tail's power and attack getting just that little bit stronger. Jet nodded. "A;right, I'll go a little easy. Hitmonlee go!" Jet through his pokeball and Hitmonlee appeared. "Let me guess Matt, you will use Gastly am I right?" Red wondered around the base, checking what was in the rooms. These rooms are all similar to what was in the Color base. Ugh...I can't stay in here any longer! Red walked outside and sat next to the shrine, back against it. He began thinking out loud, " Why does everything I do remind of the Colors? We're they that big of a part of my life?" Red put his face into his hands, trying to find an answer to his questions. Jimmy looked up at Diseh with a smirk. "Let me ask you something, Diseh. How do you suppose a broke teenager who had little to no pokemon at the time could come into power of Team Rocket so easily? Family Name...you see, during his bit of time off, Giovanni found the time to father a son, my father. 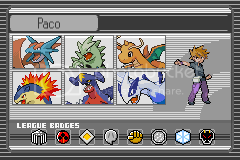 After Red's victory it was impossible for him to go back to the Rockets and put his new family in that kind of danger. However he still saw pokemon as his own tools to use for his bidding and my father saw otherwise. Once he met my mother the two moved off to Fuschia. I barely remember him. "It is ironic, isn't it? I do look up to Gold. Sure he defeated Giovanni, but with him out of the way now I'm able to do with the Rockets as I please. I don't know how he managed to control them though...I can barely manage my fleet let alone the nation." He nodded to Diseh as Feraligatr revealed the tip of his head and slowly advanced toward Empoleon. "I can't say I agree with Giovanni's methods but ya know what, Diseh, he wasn't as bad a man as everyone seems to believe. As our previous presidents, mayors, governers, etc...seemed to have proved; One's life seen by the public and seen by their walls are much different in comparison." He chuckled a bit. "I'll use my power to make light of the after effects of war, I can promise you that." Feraligatr lept from the water at Empoleon with a roar. "Operator- Elite Four- Champion's room." The room turned dim with torches lining the room. A dragon could be seen mantled on the wall behind Jet. "I've always wanted to get here..."
Matt smirked as Jet called Hitmonlee. "I may be young, but I'm not stupid, Jet. One foresight and Gastly would be done with." Matt thought for a second and tossed out his first pokeball. Ivysaur emerged and shuffled itself some. "My first pokemon, and my best friend. Let's make this a good match, Jet - how about a 3 for 3?" Ivysaur readied itself. Gardevoir felt the stinging pain of the highly effective Fury Cutter rip into her chest. "Hmm that move was judgement was strong, but the move was weak. You see it will take more that to cause lasting damage to my Gardevoir," Clarke said taking pride in his powerful psychic type, "Now Gardevoir, use Teleport." Gardevoir's silhouette faded away slowly and reappeared behind Leafeon. "Fire Punch, hit 'em hard!" Gardevoir's fist filled with a blaze and smacked it into Leafeon pulsing the grass types body into the air. "Well as a natural born coordinator, I like to combine my coordination skills with my battling ability to create a ultimate performance containing style and grace." Clarke said. He ordered for a Double Team as Leafeon's body hit the floor. Several Gardevoir appeared and created a focus blast, another command of Clarke's, once concentrated several balls of focused energy towards the grass type. Jet did a smirk of his own. "Alright, Hitmonlee move to the left of Ivysaur as fast as you can." Hitmonlee suddenly, lept and did a foward roll to the side of Ivysaur. "Now smash into her side with a Rolling Kick!" Hitmonlee then lept up in the air, did a foward roll and brung the heel of his foot down on Ivysaurs ribs. Jet crossed his arms. "You should of known that Ivysaur has terrible manuverability. I hope you have a plan." As a bell chimed in the wind, an orb of dark psychic energy twisted a distance away from the shrine. The surrounding trees rustled about over them until a figure wearing a dark green coat appeared from it, the energy roughly dispersing. Diseh looked up with a blank expression, suddenly realising Red sitting by, "Oh, sleepy-head! Sleep well?!" Diseh gave a sly grin, "Well, there you go. I knew there was something special about you. The grandson of the famous evil Rocket Leader, bahahahaha!!" he laughed to himself. He pointed outward, "You better see that promise to the end!" Diseh looked over, "Sure, your grandfather Giovanni might have had a soft spot, but that doesn't let him get away from the simple truth; he became greedy. That's the sole reason Team Rocket existed back then. Greed and a lust for more power was his downfall. Even with all his power, he still wanted more and more until someone had to put a stop to him. Make sure you don't follow his footsteps, Jimmy!" "Anyway!!" he burst out, throwing his arm to the side, "Enough of this crap! Let's go!!" "Empoleon, Ice Beam!" the emperor penguin blasted the water in front of it to a blizzard, forming a solid icecap outstretched over the pond, "Slip and slide!" Empoleon evaded Feraligatr and jumped from the water belly-first onto the icecap and rocketed down, "Now, Strength!" Suddenly, Empoleon grabbed the whole iceberg underneath it and flipped it over its head, chucking it flying towards Feraligatr. Diseh chuckled harshly, "Oh, don't worry, Clarke. I know what I'm doing..." He saw Leafeon get hit by Garevoir's weakened Fire Punch. Fire type moves were no good in the rain, and Leafeon had a good defence stat as well as attack. "Yeah, Gardevoir's a real show-pony!" he mocked, "Two can play at that game! Leafeon, jump!" Leafeon got up and leapt up into the sky, away from the explosion of the Focus Blasts just in the nick of in time. "Now!! Double Team, Fury Cutter!" Suddenly midair, Leafeon split into as many copies as Gardevoir did. As they ripped away into different directions from the one Leafeon, they struck and pounced down into a Fury Cutter into each Gardevoir. All the doubles vanished as they came into contact of each other. The real Leafeon landed, leaving the real Gardevoir left. "Leafeon, go! Leaf Blade, now!" Leafeon came rushing in, slashing its tail out towards Gardevoir in a powerful swing. Hitmonlee slammed into the ground by the Vine Whip. Hitmonlee grimmaced in pain but recovered and jumped back up. Jet did a golf clap. "Well played, but I'm intrested in what other pokemon you have. Hitmonlee jump over Ivsaur and hit with a Blaze Kick!" Hitmonlee ran at Ivsaur, hopped over her,and then got ready to hit the Blaze kick on the back of Ivysaur. Matt's eyes widened. "Blaze kick..? Ivysaur, protec--" Ivysaur was stuck hard into the air. Suddenly the ceiling filled with a blinding light. Ivysaur landed with a loud thump, she struggled now, panting heavily. "Okay...ready Ivysaur?" It nodded. The sunny day beat down harshly to thew field. "Pack everything left into a Solar Beam!" Ivy saur dug it's vines into the ground and launches the last of its energy in a gargantuan beam heading for Hitmonlee. Without realizing, Matt had had his fingers crossed. Jet nodded at Hitmonlee. Jet knew Hitmonlee could not take the hit full on or dodge the full beam. So that meant Hitmonlee would have attempt the dodge and take less damge. Hitmonlee dodged to the left but the beam still hit, causing Hitmonlee to spin violently to the ground. Hitmonlee struggled to get to it's feet and then tried his best to shake off the pain. That solarbeam took a lot out of Hitmonlee than Jet expected from an Ivysaur. "Alright Hitmonlee! Get closer to Ivysaur!" Instead od leaping as usual, Hitmonlee did a small sprint into a roll to the right side of Ivysaur. "I know your hurt, but hit another Blaze Kick!" Hitmonlee then did anther Blaze Kick in the form of a baseball slide to Ivysaur's face. There was a crash as Hitmonlee collided with the ground. Matt held Ivysaur's glowing ball in his hand. "Sorry to cut it a bit short...but that Solarbeam was all she had left." He took another ball from his belt. "This one should do better though!" Matt tossed out a Golden pokeball and out of the red light revealed Pidgeot. "Havn't gotten to use this one yet, but it had a good spar with that Rayquaza in the battle sim." Pidgeot looked down at Jet, determined. Jet shrugged. "Alright,Hitmonlee return!" A red energy surrounded Hitmonlee and he then disappeared into his pokeball. "Alright a flying pokemon. Go Dragonite!" Jet threw his pokeball and Dragonite emerged. 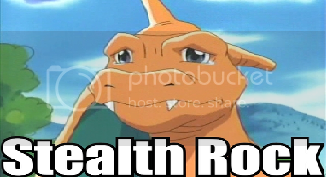 "Dragonite use Dragon Claw!" Dragonite nodded and flew at Pidgeot, preparing to strike him with Dragonites glowing claw. "Hurry! Dodge it!" Pidgeot rolled under and around the Dragonite. "Now, Brave Bird!" Pidgeot spread its wings far and jet itself forward into Dragonite, crashing hard into it. Hopefully the recoil isn't that bad... Pidgeot flew back, cawing loudly.